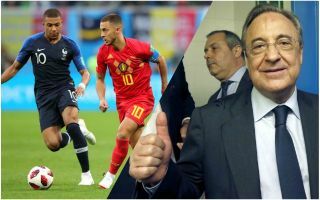 Florentino Perez is reportedly confident a transfer swoop to bring Chelsea star Eden Hazard to Real Madrid imminently, according to shock revelations from Spain. Links with Hazard go on as the transfer window remains open until the end of this month for teams from La Liga, Ligue 1 and the Bundesliga, though it shut two weeks ago for Premier League sides. While this means English teams can no longer sign players, it does not technically prevent them from selling or loaning players out. However, this means big-name departures like Hazard from Chelsea are surely less likely as the Blues would have to wait until January to sign a replacement. This, however, has not dampened Madrid president Perez’s confidence, according to an astonishing report from Don Balon. The Spaniard is claimed in this piece to believe Hazard looks ready to force his exit from Stamford Bridge imminently, such is his desire to quit the club this season. The report goes on to say Perez considers this £180million deal a matter of hours away, though we cannot help but question his optimism here. Eden Hazard to Real Madrid – surely not? While that kind of money would be hard for any club to turn down, it would surely not be worth it for Chelsea, no matter what they could do with it in January. This is largely still the same squad that finished 5th in the Premier League last season, so losing a player as influential as Hazard without a replacement coming in for the next four months is surely unthinkable for them to even consider. Still, stranger things have happened, and it seems Perez is not giving up on this one – and of course, Real have a decent track record of spending whatever it takes to get the players they want. If they could somehow convince Chelsea to sell now, however, it would be one of the stories of the last few years, let alone this summer, in an incredible statement of intent to regain the La Liga title from rivals Barcelona.